MISSION, KS--(Marketwire - Sep 13, 2012) - (Family Features) When a home fire occurs, you have very little time to get out. A working smoke alarm doubles your chances of survival, yet more than twenty percent of American homes are without them. This means roughly 23 million homes are at risk because of non-working smoke alarms and an additional 5 million homes are at risk by not having smoke alarms. Twenty-five years ago, Energizer and the International Association of Fire Chiefs teamed up to address this problem by providing vital fire safety information to families. They recommend these tips to make a plan for keeping your family and home safe. On average, families have less than three minutes from the time the first smoke alarm sounds to escape a fire. Installing smoke alarms on every level of the home and developing a plan of escape can give your family precious minutes to get out and get to safety. Draw a floor plan of your home and sketch exit routes out of every room. Make sure you have a fire escape ladder long enough to reach the ground from upstairs rooms. Assign an outside meeting place, so you can quickly locate each other. The peak time for home fire fatalities is between 11 p.m. and 7 a.m., when most families are asleep. Do not trap electrical cords against walls. Heat can build up, posing a fire hazard. Use only lab-approved electric blankets and warmers. Make sure cords are not worn or coming apart. Do not leave electric blankets switched on all night unless they are marked "suitable for all night use." Keep bedding, curtains and other combustible items at least three feet away from space heaters. Replace mattresses made before the 2007 Federal Mattress Flammability Standard. By law, mattresses made since then are required to be safer. Install smoke alarms in every bedroom and outside each sleeping area. Check electrical cords for fraying or signs of damage and don't run them under carpets. Candles are responsible for almost 10,000 fires a year. Use new flameless wax candles which provide the realistic flicker of a scented wax candle without the hazard of open flame. Keep battery-operated flashlights and lanterns in easily accessible places in case of power failure. Cooking is the leading cause of reported home fires and home fire injuries in the United States. Never use extension cords to plug in cooking appliances; they can overload the circuit. Keep flammable items away from the cooktop. Keep the cooktop, burners and oven clean. Have a fire extinguisher installed in or near your kitchen. Store all combustible materials in clearly marked containers away from regular sources of heat, such as water heaters, space heaters, boilers and furnaces. Keep flammable products in a dedicated storage container with a closed door. Get rid of stacked boxes, recycling and trash. 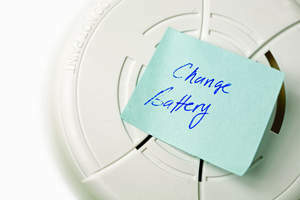 Find more fire safety information to keep your family and home safe at www.Energizer.com. Daylight-saving time ends Sunday, Nov. 4, 2012 and marks the 25th anniversary of the Change Your Clock Change Your Battery® program, a partnership with Energizer and the International Association of Fire Chiefs (IAFC). This program reminds people to change the batteries in their smoke alarms and carbon monoxide detectors when they change their clocks. It's part of the Energizer platform -- that's positivenergy™ -- which combines a commitment to performance in products and responsibility in partnerships and programs that make a positive impact on the world. Clean the smoke alarms and carbon monoxide detectors each month with a vacuum. The International Association of Fire Chiefs recommends replacing smoke alarms every 10 years and having a combination of both ionization and photoelectric smoke alarms to keep you alert to all types of home fires.